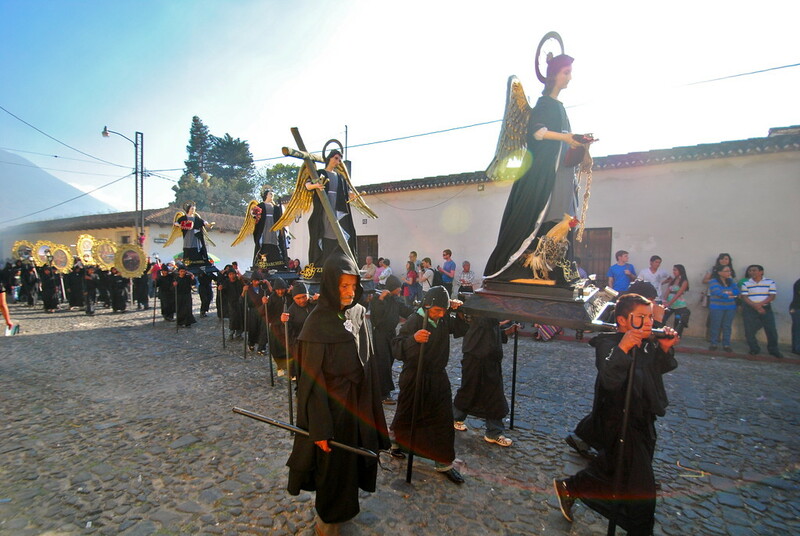 Arriving on the outskirts of Antigua, Guatemala, our bus ground to a halt as a chorus of horns, trumpets and drums echoed around us. 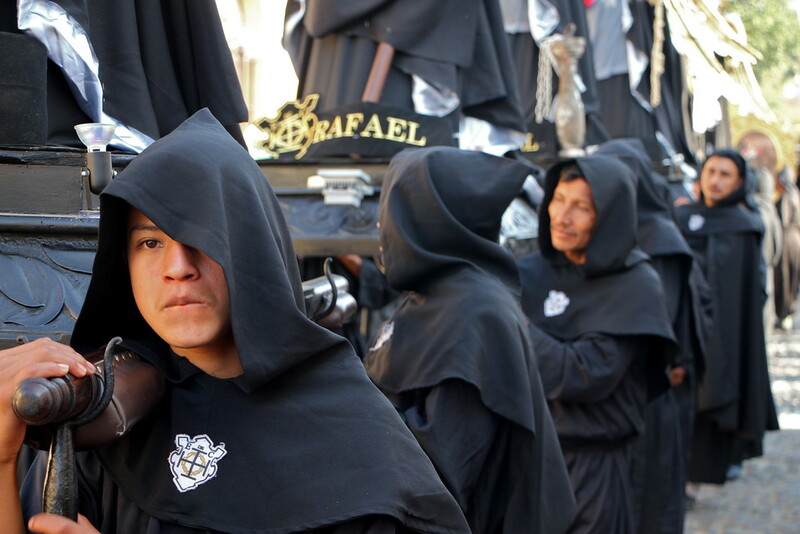 “I’m sorry, but this is as close as I can get you to the centre – the Semana Santa processions have closed all the streets.” Our driver apologetically told us as he handed us our bags from the roof of the bus. 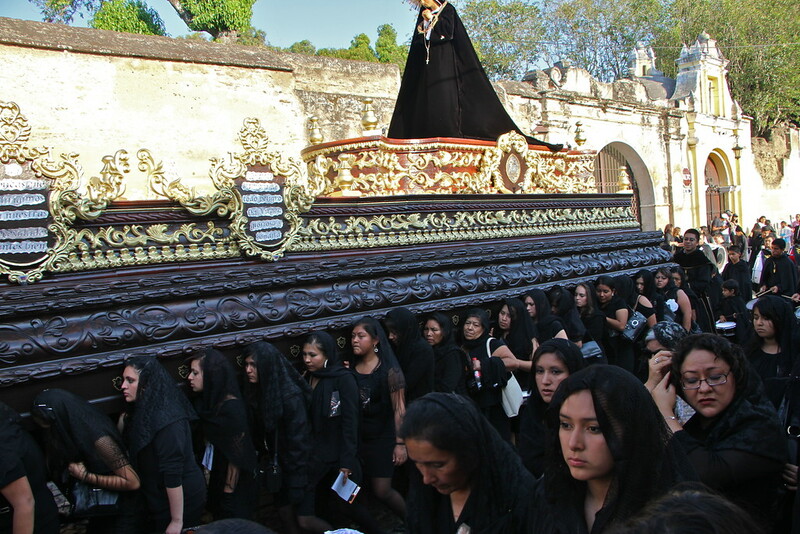 Semana Santa Guatemala, or Holy Week in Antigua is revered as one of the very best in all of Latin America, and we’d arrived in the evening just as one of the many processions was under way. A few blocks from the centre, we lugged our bags onto our backs and made for the heart of the action. 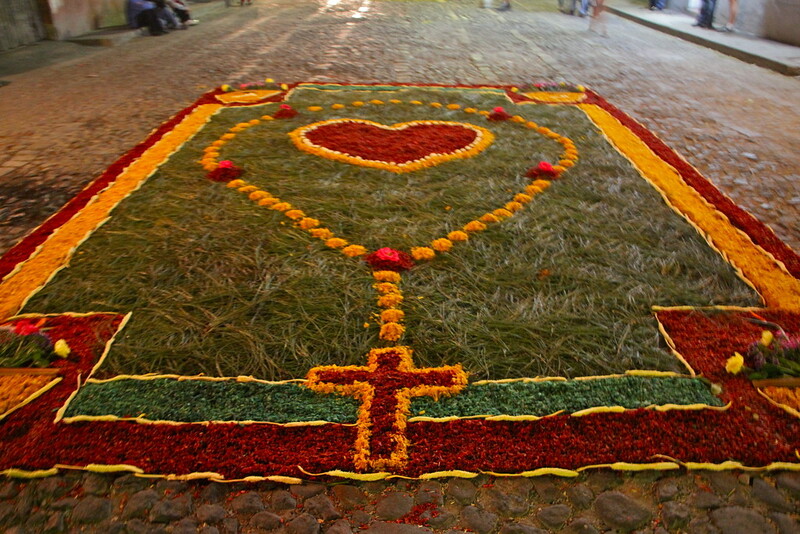 As we made our way through the streets, thousands of people lined the pavements as the processions made their way through. 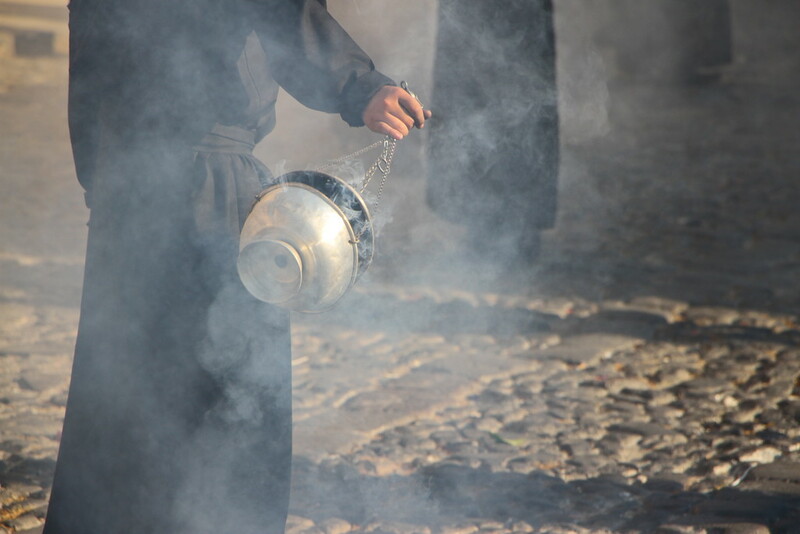 The air thick with incense, combined with the unnerving beat of the drums gave us a welcome we would never forget. Arriving from Ometepe island in Nicaragua, we felt like we’d arrived in another world. 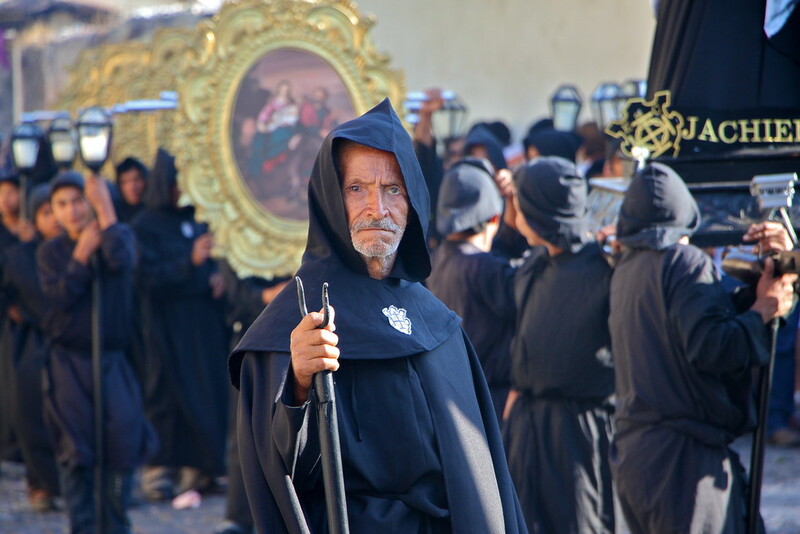 Holy Week in Antigua is special, with numerous processions in the day and evening, set against a backdrop of beautifully coloured colonial buildings. 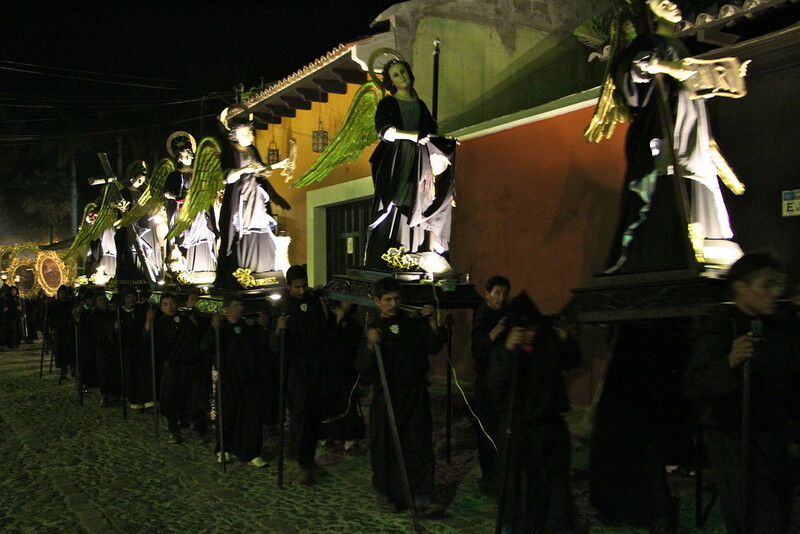 During the Saturday, we marvelled as a procession began at 2pm and would continue on until 6am. 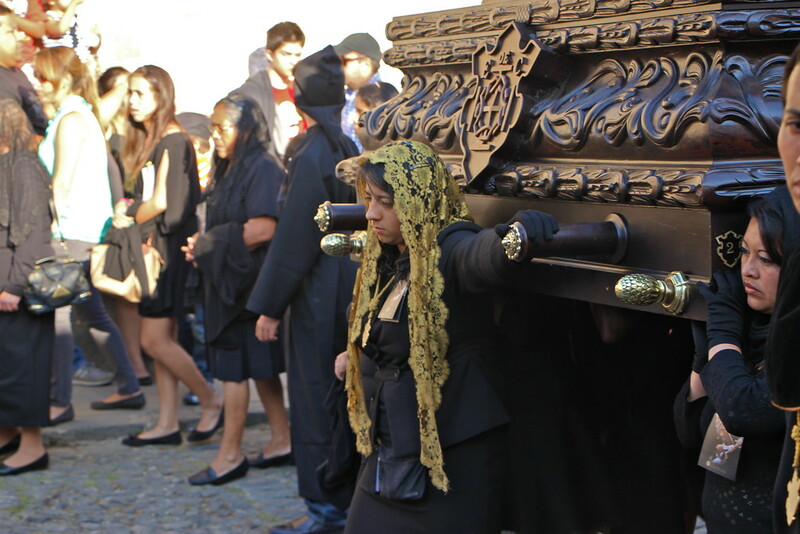 This was a special procession, as hundreds of women garbed in black solemnly walked through the streets accompanied by a hauntingly powerful band. 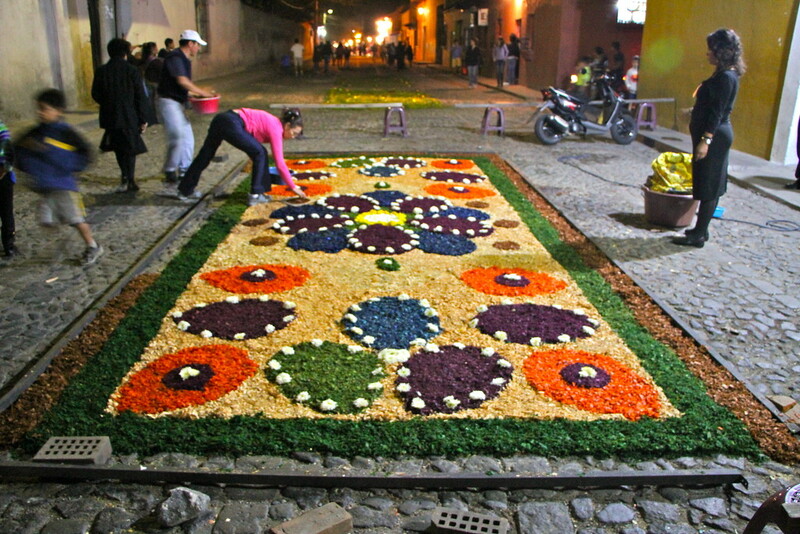 Everywhere the procession went, it would be greeted by displays along the street, each very different and beautiful in their own right. 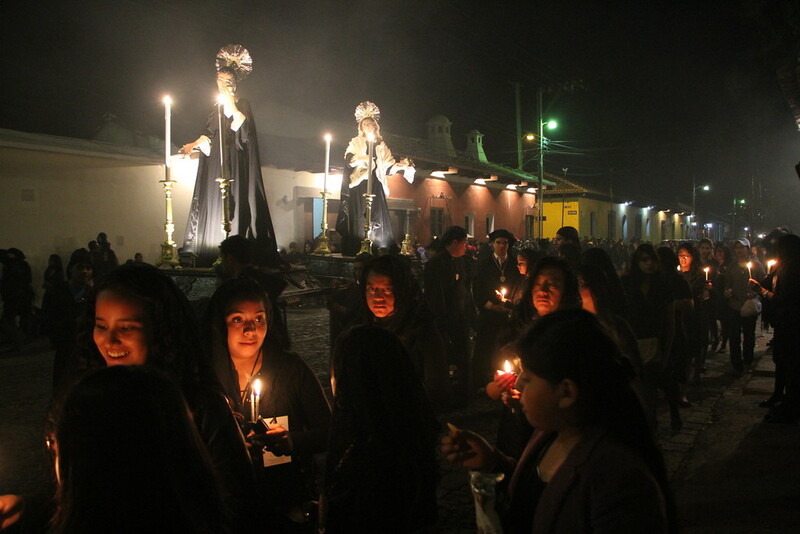 As night fell, the procession took on a different feel, the darkness providing a dramatic backdrop as the procession relentlessly marched on. 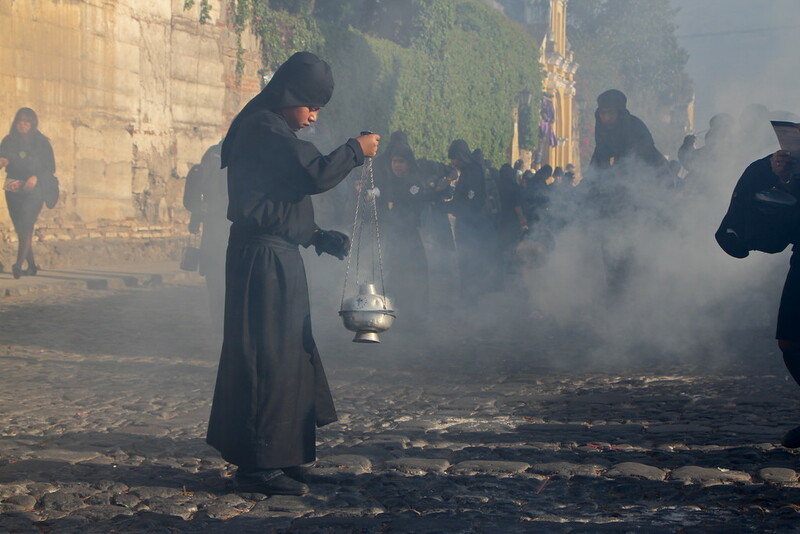 The heat and smell of the incense burning became more intense, the air thick with white smoke. The band became louder and louder, as the women continued to walk the streets on their seemingly never ending march. 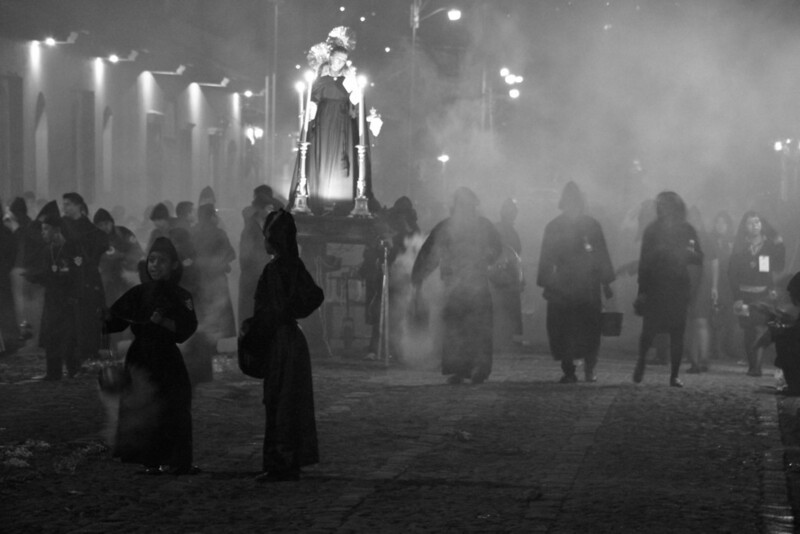 Being in Antigua to witness the celebrations was a fantastic experience, and something we would highly recommend. 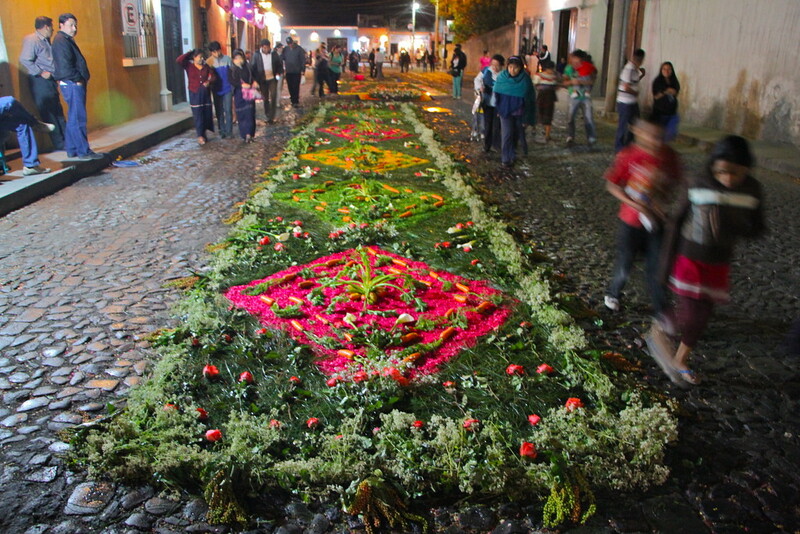 Just make sure that you book accommodation in advance, as literally the whole town books out! 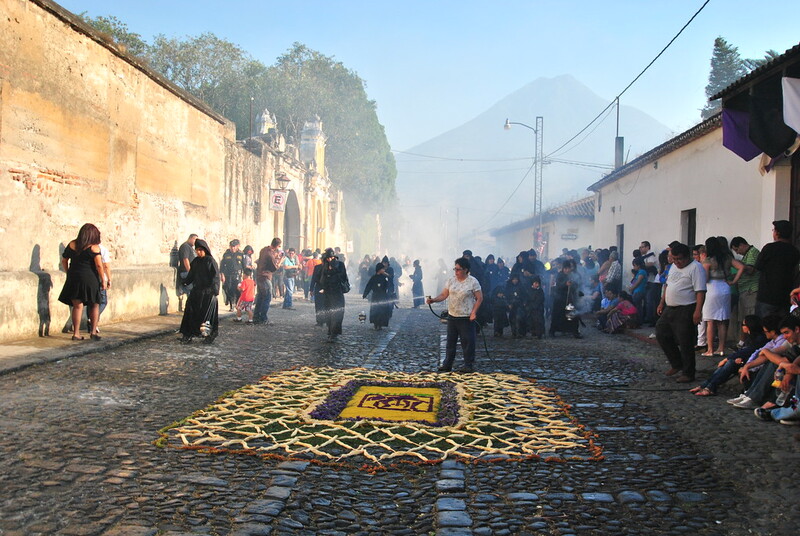 Looking for more Guatemala inspiration? Click here.